Geometry Wars: Galaxies takes the classic formula developed in Geometry Wars: Retro Evolved that was created for the Xbox Live Arcade and turns it into a full fledged game. You still have the same basic gameplay, but now there are many different planets you can play on each featuring a slight twist on the formula. There is also many new enemies along with all the classics returning. 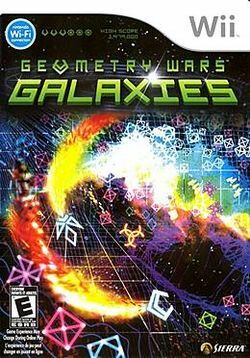 The object of Geometry Wars: Galaxies is to survive as long as possible and score as many points as possible by destroying a constant, ever-increasing swarm of enemies. The game takes place in a closed, two-dimensional playfield, and the game ends when the player loses his/her last life. The player controls a claw-shaped "ship" that can move and fire simultaneously in any direction; the ship's movement and firing directions are independent of one another. This page was last edited on 4 November 2008, at 17:13.